Mood Spoons are a fun way to add some color to your day. Great for ice cream and frozen yogurt parlors to advertise your logo or message. Your customers are sure to take them home and remember you! These Mood Spoons change color with ice cold liquids or ice cream. 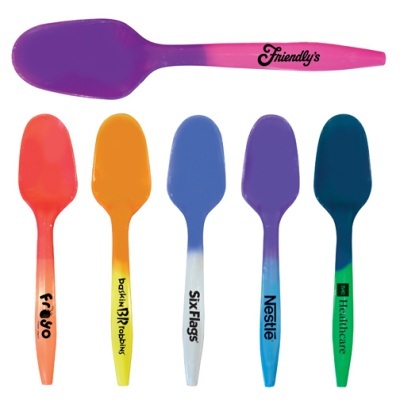 Mood Spoons come in six fun color combinations: blue to purple, orange to red, white to blue, yellow to orange, pink to purple, green to blue. Standard Imprint Colors provided at no extra charge: Black, White, Red, Lt. Blue, Med. Blue, Dk. Blue, Lt. Green, Med. Green, Dk. Green, Brown, Purple, Yellow, Teal, Orange, Maroon, Gold, Athletic Gold, & Silver. BLACK IMPRINT IS RECOMMENDED on our Mood Spoons. Mood Spoons are 5-1/2" long with an imprint area of 1-1/2" wide x 1/4" high on 1-side of the spoon handle.